Big Price Drop! Full of Pleasant Surprises! 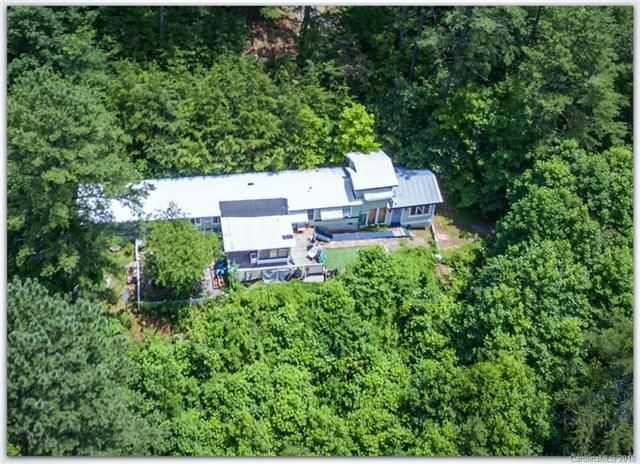 Fully furnished down to the linens and dishes for an extra $7000 This unique Smoky Mountain Retreat is a one-level mountainside DUPLEX 10 miles from the edge of booming Asheville, but can easily be converted to a SINGLE FAMILY 2BR/2BA 1,500 sq ft home in one easy step. One unit, with Master Suite and open floor plan, is a popular vacation rental. The adjoining Owner's Quarters with loft has its own creative flair and separate driveway. Stunning MOUNTAIN VIEWS from every room, fenced yard, deck, covered porch and sun room. Very PRIVATE and QUIET, heavily wooded setting on 2 lots, 1.15 acre. CUSTOM TOUCHES give each side a unique personality, with artful mosaic tile floors and contemporary leaded glass windows, vaulted beadboard ceiling, French doors and more! COOLER SUMMERS than most of the state, typically mild winters. LOW MAINTENANCE landscaping, easy care indoors, metal roof. Proven INVESTMENT VALUE. Rental $95 weeknights $115 weekends.